International production, today, is no longer exclusively about FDI on the one hand and trade on the other (figure 5). Non-equity modes (NEMs) of international production are of growing importance, generating over $2 trillion in sales in 2010, much of it in developing countries. 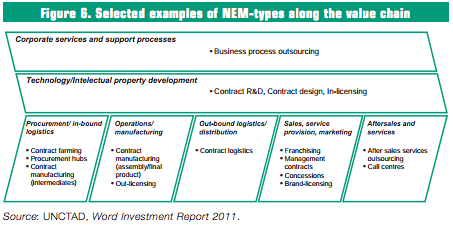 NEMs include contract manufacturing, services outsourcing, contract farming, franchising, licensing, management contracts and other types of contractual relationships through which TNCs coordinate activities in their global value chains (GVCs) and influence the management of host-country firms without owning an equity stake in those firms. From a development perspective, both NEM partnerships and foreign affiliates (i.e. FDI) can enable host countries to integrate into GVCs. A key advantage of NEMs is that they are flexible arrangements with local firms, with a built-in motive for TNCs to invest in the viability of their partners through dissemination of knowledge, technology and skills. This offers host economies considerable potential for longterm industrial capacity building through a number of key channels of development impact such as employment, value added, export generation and technology acquisition (table 4). On the other hand, by establishing a local affiliate through FDI, a TNC signals its long-term commitment to a host economy. Attracting FDI is also the better option for economies with limited existing productive capacity. NEMs may be more appropriate than FDI in sensitive situations. In agriculture, for example, contract farming is more likely to address responsible investment issues – respect for local rights, livelihoods of farmers and sustainable use of resources – than large-scale land acquisition. For developing country policymakers, the rise of NEMs not only creates new opportunities for productive capacity building and integration into GVCs, there are also new challenges, as each NEM mode comes with its own set of development impacts and policy implications. Foremost among the core competencies of a TNC is its ability to coordinate activities within a global value chain. TNCs can decide to conduct such activities in-house (internalization) or they can entrust them to other firms (externalization) – a choice analogous to a “make or buy” decision. Internalization, where it has a cross-border dimension, results in FDI, whereby the international flows of goods, services, information and other assets are intra-firm and under full control of the TNC. Externalization results in either arm’s-length trade, where the TNC exercises no control over other firms or, as an intermediate “middle-ground” option, in non-equity inter-firm arrangements in which contractual agreements and relative bargaining power condition the operations and behaviour of host-country firms. Such “conditioning” can have a material impact on the conduct of the business, requiring the host-country firm to, for example, invest in equipment, change processes, adopt new procedures, improve working conditions, or use specified suppliers. The ultimate ownership and control configuration of a GVC is the outcome of a set of strategic choices by the TNC. In a typical value chain, a TNC oversees a sequence of activities from procurement of inputs, through manufacturing operations to distribution, sales and aftersales services (figure 6). In addition, firms undertake activities – such as IT functions or R&D – which support all parts of the value chain (upper parts of figure 6). In a fully integrated company, activities in all these segments of the value chain are carried out in-house (internalized), resulting in FDI if the activity takes place overseas. However, in all segments of the value chain TNCs can opt to externalize activities through various NEM types. For example, instead of establishing a manufacturing affiliate (i.e. FDI) in a host country, a TNC can outsource production to a contract manufacturer or permit a local firm to produce under licence. The TNC’s ultimate choice between FDI and NEMs (or trade) in any segment of the value chain is based on its strategy, the relative costs and benefits, the associated risks, and the feasibility of available options. In some parts of the value chain NEMs can be substitutes for FDI, in others the two may be complementary. Cross-border NEM activity worldwide is estimated to have generated over $2 trillion of sales in 2010. Of this amount, contract manufacturing and services outsourcing accounted for $1.1–1.3 trillion, franchising for $330–350 billion, licensing for $340–360 billion, and management contracts for around $100 billion. Some of the industry breakdowns by mode are given in table 5. These estimates are incomplete, including only the most important industries in which each NEM type is prevalent. The total also excludes other non-equity modes such as contract farming and concessions, which are significant in developing countries. For example, contract farming activities by TNCs are spread worldwide, covering over 110 developing and transition economies, spanning a wide range of agricultural commodities and accounting for a high share of output. There are large variations in relative size. In the automotive industry, contract manufacturing accounts for 30 per cent of global exports of automotive components and a quarter of employment. In contrast, in electronics, contract manufacturing represents a significant share of trade and employment. In labourintensive industries such as garments, footwear and toys, contract manufacturing is even more important. Putting different modes of international production in perspective, cross-border activity related to selected NEMs of $2 trillion compares with exports of foreign affiliates of TNCs of some $6 trillion in 2010. However, NEMs are particularly important in developing countries. 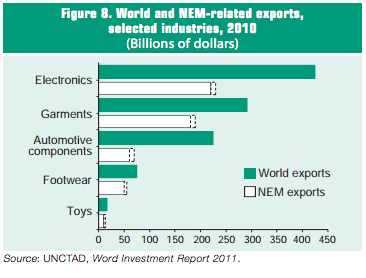 In many industries, developing countries account for almost all NEM-related employment and exports, compared with their share in global FDI stocks of 30 per cent and in world trade of less than 40 per cent. NEMs are also growing rapidly. In most cases, the growth of NEMs outpaces that of the industries in which they operate. This growth is driven by a number of key advantages of NEMs for TNCs: (1) the relatively low upfront capital expenditures required and the limited working capital needed for operation; (2) reduced risk exposure; (3) flexibility in adapting to changes in the business cycle and in demand; and (4) as a basis for externalizing non-core activities that can often be carried out at lower cost by other operators. 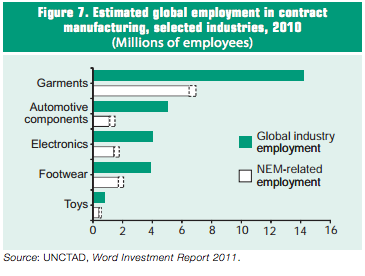 UNCTAD estimates that worldwide some 18–21 million workers are directly employed in firms operating under NEM arrangements, most of whom are in contract manufacturing, services outsourcing and franchising activities (figure 7). Around 80 per cent of NEM-generated employment is in developing and transition economies. Employment in contract manufacturing and, to a lesser extent, services outsourcing, is predominantly based in developing countries. The same applies in other NEMs, although global figures are not available; in Mozambique, for instance, contract farming has led to some 400,000 smallholders participating in global value chains. 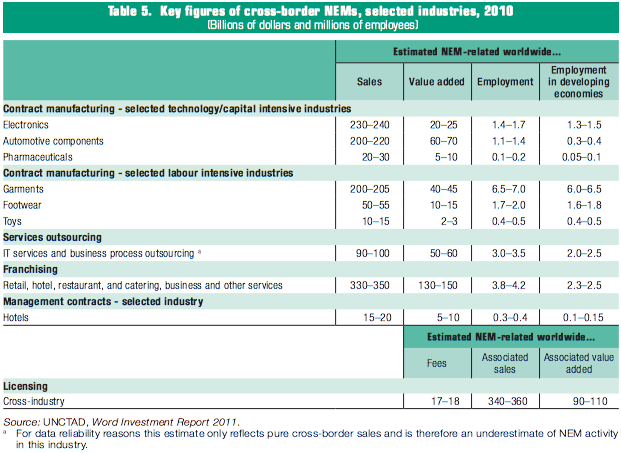 Working conditions in NEMs based on low-cost labour are often a concern, and vary considerably depending on the mode and the legal, social and economic structures of the countries in which NEM firms are operating. The factors that influence working conditions in non-equity modes are the role of governments in defining, communicating and enforcing labour standards and the sourcing practices of TNCs. The social responsibility of TNCs has extended beyond their own legal boundaries and has pushed many to increase their influence over the activities of value chain partners. It is increasingly common for TNCs, in order to manage risks and protect their brand and image, to influence their NEM partners through codes of conduct, to promote international labour standards and good management practices. An additional concern relates to the relative “footlooseness” of NEMs. The seasonality of industries, fluctuating demand patterns of TNCs, and the ease with which they can shift NEM production to other locations can have a strong impact on working conditions in NEM firms and on stability of employment. The impact of NEMs on local value added can be significant. It depends on how NEM arrangements fit into TNC-governed GVCs and, therefore, on how much value is retained in the host economy. It also depends on the potential for linkages with other firms and on their underlying capabilities. In efficiency seeking NEMs, such as contract manufacturing or services outsourcing, it is possible for value capture in the host economy to be relatively small compared to the overall value creation in a GVC, when the scope for local sourcing is limited and goods are imported, processed and subsequently exported, as is often the case in the electronics industry, for example. Although value captured as a share of final-product sales price may be limited, it can nevertheless represent a significant contribution to the local economy, adding up to 10–15 per cent of GDP in some countries. Local sourcing and the overall impact on host-country value added increases if the emergence of contract manufacturing leads to a concentration of production and export activities (e.g. in clusters or industrial parks). The greater the number of plants and the more numerous the linkages with TNCs, the greater will be the spillover effects and local value added. In addition, clustering can reduce the risk of TNCs shifting production to other locations by increasing switching costs. NEMs are inextricably linked with international trade, shaping global patterns of trade in many industries. In toys, footwear, garments, and electronics, contract manufacturing represents more than 50 per cent of global trade (figure 8). NEMs can thus be an important “route-to-market” for countries aiming at export-led growth, and an important initial point of access to TNC governed global value chains, before gradually building independent exporting capabilities. Export gains can be partially offset by higher imports, reducing net export gains, where local value added is limited, especially in early stages of NEM development. NEMs are in essence a transfer of intellectual property to a host-country firm under the protection of a contract. Licensing involves a TNC granting an NEM partner access to intellectual property, usually with contractual conditions attached, but often with some training or skills transfer. International franchising transfers a business model, and extensive training and support are normally offered to local partners in order to properly set up the new franchise with wide-ranging implications for technology dissemination. In some East and South-East Asian economies in particular, but also in Eastern Europe, Latin America and South Asia, technology and skills acquisition and assimilation by NEM companies in electronics, garments, pharmaceuticals, ITservices and business process outsourcing (BPO) have led to their transformation into TNCs and technology leaders in their own right. Although technology acquisition and assimilation through NEMs is a widespread phenomenon, this is not a foregone conclusion, especially at the level of second and third tier suppliers, where linkages may be insufficient or of low quality. A key factor is the absorptive capacity of local NEM partners, in the form of their existing skills base, the availability of workers that can be trained to learn new skills, and the basic prerequisites to turn acquired skills into new business ventures, including the regulatory framework, the business environment and access to finance. Another important factor is the relative bargaining power of TNCs and local NEM partners. Both factors can be influenced by appropriate policies. Concerns exist that cross-border NEMs in some industries may be a mechanism for TNCs to circumvent high social and environmental standards in their production network. Pressure from the international community has pushed TNCs to take greater responsibility for such standards throughout their global value chains. There is now a significant body of evidence to suggest that TNCs are likely to use more environmentally friendly practices than domestic companies in equivalent activities. The extent to which TNCs guide NEM operations on social and environmental practices depends, first, on their perception of and exposure to legal liability risks (e.g. reparations in the case of environmental damages) and business risks (e.g damage to their brand and lower sales); and, secondly, on the extent to which they can control NEMs. TNCs employ a number of mechanisms to influence NEM partners, including codes of conduct, factory inspections and audits, and thirdparty certification schemes. The immediate contributions to employment, to GDP, to exports and to the local technology base that NEMs can bring help to provide the resources, skills and access to global value chains that are prerequisites for long-term industrial capacity building. A major part of the contribution of NEMs to the build-up of local productive capacity and long-term prospects for industrial development is through the impact on enterprise development, as NEMs require local entrepreneurs and domestic investment. Such domestic investment, and access to local or international financing, is often facilitated by NEMs, either through explicit measures by TNCs providing support to local NEM partners, or through the implicit guarantees stemming from the partnership with a major TNC itself. 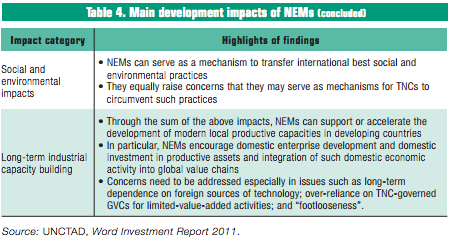 While the potential contributions of NEMs to long-term development are clear, concerns are often raised (especially with regard to contract manufacturing and licensing), that countries relying to a significant extent on NEMs for industrial development risk remaining locked-in to low-value-added segments of TNCgoverned global value chains and remaining technology dependent. In such cases, developing economies would run a further risk of becoming vulnerable to TNCs shifting productive activity to other locations, as NEMs are more “footloose” than equivalent FDI operations. The related risks of “dependency” and “footlooseness” must be addressed by embedding NEMs in the overall development strategies of countries. 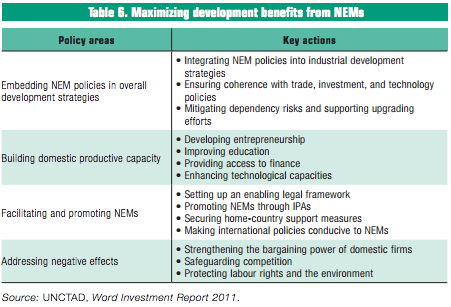 Policies are instrumental for countries to maximize development benefits and minimize the risks associated with the integration of domestic firms into NEM networks of TNCs (table 6). There are four key challenges for policymakers: first, how to integrate NEM policies into the overall context of national development strategies; second, how to support the building of domestic productive capacity to ensure the availability of attractive business partners that can qualify as actors in global value chains; third, how to promote and facilitate NEMs; and fourth, how to address negative effects of NEMs. support industrial upgrading in line with a country’s development stage, ensuring that firms move to higher value-added stages in the value chain, helping local NEM partners reduce their technology dependency, develop their own brands, or become NEM originators in their own right. An important element of industrial development strategies that incorporate NEMs are measures to prevent and mitigate impacts deriving from the “footlooseness” of some NEM types, by balancing diversification and specialization. Diversification ensures that domestic companies are engaged in multiple NEM activities, both within and across different value chains, and are connected to a broad range of NEM partners. Specialization in particular value chains improves the competitive edge of local NEM partners within those chains and can facilitate, in the longer term, upgrading to segments with greater value capture. In general, measures should aim at maintaining and increasing the attractiveness of the host country for TNCs and improve the “stickiness” of NEMs by building up local mass, clusters of suppliers, and the local technology base. Continuous learning and skills upgrading of domestic entrepreneurs and employees are also important to ensure domestic firms can move to higher value-added activities should foreign companies move “low end” production processes to cheaper locations. Improving the capacity of locals to engage in NEMs has several policy aspects. Proactive entrepreneurship policies can strengthen the competitiveness of domestic NEM partners and range from fostering start-ups to promoting business networks. Embedding entrepreneurship knowledge into formal education systems, combined with vocational training and the development of specialized NEM-related skills is also important. A mix of national technology policies can improve local absorptive capacity and create technology clusters and partnerships. Access to finance for domestic NEM partners can be improved through policies reducing borrowing costs and the risks associated with lending to SMEs, or by offering alternatives to traditional bank credits. Facilitation efforts can also include initiatives to support respect for core labour standards and CSR. Promoting and facilitating NEM arrangements depends, first, on clear and stable rules governing the contractual relationships between NEM partners, including transparency and coherence. This is important, as NEM arrangements are often governed by multiple laws and regulations. Conducive NEM-specific laws (e.g. franchising laws, rules on contract farming) and appropriate intellectual property (IP) protection (particularly relevant for IP-intensive NEMs such as licensing, franchising and often contract manufacturing) can also help. While the current involvement of investment promotion agencies in NEM-specific promotion is still limited, they could expand their remit beyond FDI to promote awareness of NEM opportunities, engage in matchmaking services, and provide incentives to start-ups. To address any negative impacts of NEMs, it is important to strengthen the bargaining power of local NEM partners vis-à-vis TNCs to ensure that contracts are based on a fair sharing of risks and benefits. The development of industry-specific NEM model contracts or negotiation guidelines can contribute to achieving this objective. If TNCs engaged in NEMs acquire dominant positions, they may be able to abuse their market power to the detriment of their competitors (domestic and foreign) and their own trading partners. Therefore, policies to promote NEMs need to go hand in hand with policies to safeguard competition. Other public interest criteria may require attention as well. Protection of indigenous capacities and traditional activities, that may be crowded out by a rapid increase in market shares of successful NEMs, is essential. In the case of contract farming for instance, policies such as these would result in model contracts or guidelines supporting smallholders in negotiations with TNCs; training on sustainable farming methods; provision of appropriate technologies and government-led extension services to improve capacities of contract farmers; and infrastructure development for improving business opportunities for contract farmers in remote areas. If contract farming was given more pride of place in government policies, direct investment in large-scale land acquisitions by TNCs would be less of an issue. Finally, home-country initiatives and the international community can also play a positive role. Home-country policies that specifically promote overseas NEMs include the expansion of national export insurance schemes and political risk insurance to also cover some types of NEMs. Internationally, while there is no comprehensive legal and policy framework for fostering NEMs and their development contribution, supportive international policies range from relevant WTO agreements and – to a limited extent – IIAs, to soft-law initiatives contributing to harmonizing the rules governing the relationship between private NEM parties or guiding them in the crafting of NEM contracts.